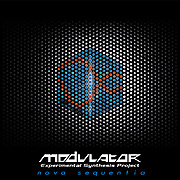 Vague disasters and tricky sub-themes populate the music of Modulator ESP. A fearless sonic collagist, Jez Creek is our untamed man here taking Spacemusic liberties. His concerts are more a medium in which to learn, rather than an expression of his urge to tell. Creek's musical sensibilities and command of technology have shaped Nova Sequentia (65'48"), while the dreams of the listener may be better suited to its interpretation. A live album for traveling in place, it inhabits a theoretical plane. From contained sections of ascetic clean-lined minimalism, to no-go zones of dirge dark, Creek occasionally pushes too far into his timbral netherworld. Charged, heaving passages of writhing electro-storms are rendered masterfully, and powerfully expressed. A far-reaching rumination for synthesizer, Nova Sequentia possesses a striking soulfullness - as its coarse, gradual transformation of mood will try to remind us that we are not sleeping. Unexpected shifts, from light bearing chords and pastoral textures to throbbing sequencer loops, carry Nova Sequentia briskly forward. The pulse that drives this piece fills the enduring emptiness with a repeating rivulet of notes. Drifting haphazardly into space, the tones echo and brighten amidst a deep night of roiling effects, accents and modulations. The impact becomes known over time, as the building energy secretly pulls us further through the cerebral cosmos of the lower mind. It may seem that structure has been discarded, with a more ephemeral approach taking its place, but a consistency of mood brings together all the vibrating mystery into something unusually listenable as a complete piece. We find that this music engages the audience's mind more than any other type - promoting lower cognitive processes which may guide conscious thought. The beauty of Electronic Music never feels devoid of purpose. Nova Sequentia is a worthy journey.